The first time I listened to this album in my car, I nearly missed my exit on the expressway. There is so much hep stuff happening in these new big band arrangements of tunes by Thelonious Monk that I was transported to another realm, one where the car seems capable of driving itself. Then it struck me: That’s precisely what’s happening with these charts and this ensemble of L.A.’s finest musicians and special guests, all under the direction of pianist/conductor/arranger John Beasley. Everything on Presents MONK’estra Vol. 1 feels so natural and inevitable, it’s almost as if the material plays itself. And if you enjoy Monk—whether for his undeniable logic, quirky song architecture or innate sense of swing—Beasley’s band will leave you rapt. 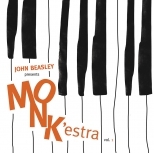 Beasley has been writing big band charts since he was a teenager, and he has long been fascinated by Monk’s music (this debut recording by the MONK’estra is actually Beasley’s third album of material by the High Priest of Bebop). Beasley’s MONK’estra has performed live since 2013, and he has served as musical director for the Monk Institute’s Jazz Day gala concerts since 2011 and for International Jazz Day events since 2012. 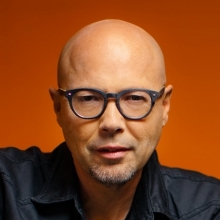 (He has done plenty of commercial work as well, most notably as the lead arranger for TV’s American Idol from 2005 to 2016.) Beasley knows his Monk inside and out, and he knows his way around a chart. But, most importantly, this onetime member of groups led by Freddie Hubbard and Miles Davis knows how to give his bandmembers—including guest stars Gary Burton on vibes (“Epistrophy”) and Grégoire Maret on harmonica (“Ask Me Now”)—sufficient freedom to stylize the written passages and improvise with abandon. In applying all of his acquired skills and personal passions to Presents MONK’estra Vol. 1, Beasley brings Monk to life once again for modern-minded listeners.